PRP Rejuvenation therapy is a non-surgical procedure which uses your own blood platelets to stimulate new cell growth, facial rejuvenation, skin texture, improves skin complexion and to restore facial volume. PRP Rejuvenation is a skin treatment in which fillers are used with Platelet Rich Plasma (PRP) to repair and enhance the shape of the face. In this treatment, our blood is taken and then it is gyrated to separate your blood cells from plasma and platelets. It is then re-injected into our skin to stimulate new skin cells and collagen. 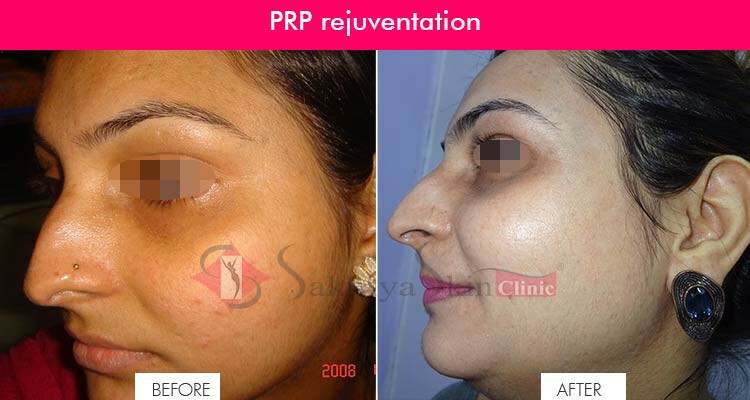 For an apt PRP Therapy in Mumbai pay a visit to Sakhiya Skin Clinic. Who should consider a PRP treatment? Women suffering from wrinkles and fine lines. Toning and tightening of the skin. Dark under eye circles and crow’s feet. Suffering from acne scars. PRP Rejuvenation is a skin care treatment simple in which our own platelets are used to instruct the body to create new collagen for smoother and toned skin. Platelet-rich plasma is the extract of blood which contains more, active proteins and growth factors for skin tissues and healing. When PRP is injected back into the skin by injection or micro needling it starts stem cell response. The fibroblasts replace tissue that has been lost through aging and returns a healthy skin which looks refreshed and beautiful. You can get the best treatment by the best plastic surgeons in Mumbai at Sakhiya Skin Clinic. Consultation is done before treatment. Blood is collected and separated. Re-injected into the skin under medical supervision. Proper follow-up and care is done. The process of PRP Rejuvenation will take time. It will take multiple sittings which can be determined by a certified dermatologist according to the skin type of the patient. A proper treatment will eliminate all the dark patches, scars, wounds, pigments from the skin. Most of the patients require treatments at four to six-week intervals. The first change they notice on their face is skin’s elasticity. These improvements completely depend on the person because the injected product is 100% yours. Also, one must be aware that the factors like smoking, stress, and illness will affect the results. For advanced PRP Skin Treatment in Mumbai, visit Sakhiya Clinic. It takes time to recover your skin. Redness will appear over the skin. Pregnant ladies should avoid this treatment. You will face swelling over the skin. PRP stands for Platelet Rich Plasma, which is a concentration of platelets derived from your own blood (Autologous) to trigger a healing process. HOW DOES THE INJECTION OF PRP WORK? It improves the condition of the skin i.e. improving tone and texture. It is a natural approach of using your own unique tissue growth factors and healing properties to revitalize the skin by improving blood supply and stimulating collagen formation, which lasts longer than chemical treatments. It involves PRP injections over face using very fine needle by a special technique which results in repairing of full-face making skin look younger, firm and glowing! A sample of blood will be taken from a vein in your arm under sterile conditions. The blood will be placed in a centrifuge[a device that spins the blood] This helps to separate the blood cells from plasma and allows concentration of the platelets. This process increases the concentration of platelets, which have the healing growth factors. The preparation takes about 15 minutes. The finished PRP product is then available for injection into the skin where skin rejuvenation and regeneration is required. WHICH BODY AREA CAN BE TREATED? The crinkling skin around the eyes, cheeks, and midface, jawline, neck, scalp & other areas. Yes, it's safe. The treatment at Sakhiya Clinic is conducted by registered medical practitioners under strict hygienic conditions. Pre-procedure, an anesthetic cream is applied, so, the pain is almost negligible. WHEN CAN I SEE THE RESULTS OF PRP INJECTIONS ON MY FACE? Since PRP is thought to rejuvenate the skin internally, we see results over the course of a few weeks. Initially, there is some swelling caused by the procedure which subsides in 3-5 days. DO I REQUIRE MORE THAN 1 SESSION? Yes! Repeat sessions are required 6-8months apart.